The Competition is intended to provide a real-world experience for the students that will encourage healthy competition, professionalism and interaction by our future business leaders, both among themselves and with our business community. The Rules and Guidelines are not all encompassing and situations may arise that have not been covered. It is the expectation of the Organizers that any issues or disputes will be resolved in the spirit of the Competition. Competition is based on a system of honor whereby we expect participants to use their common sense in making this a fair competition. Strict adherence to the rules is therefore also required. As part of its long-term partnership with leading graduate business school INCAE Business School and CIMS (Sustainable Markets Intelligence Center), Nespresso has asked INCAE/CIMS to organize, manage and administer this global MBA Challenge on its behalf. All details related to registration and general conditions can be found on this website. All final case submissions produced during the Case Competition are the rightful property of the organizers (CIMS/INCAE/Nespresso). Official language of the competition is English. Therefore, all communication and documents will be in that language. Registration: School and team registration will open in November 2019 through the website. Only one team is permitted per university to register. If more than one team from the same university wishes to participate, an internal competition is recommended in order to determine the team that will ultimately represent the university. School registration deadline: The school must be registered by February, 2020. It should be done through the website by a university representative (a “faculty sponsor”), and not by a student. Team registration deadline: The team of four students must register through the website by February, 2020. Case study release and proposal submission deadline: The MBA Challenge case study will be released between March or April 2020. At this point, teams have two weeks to prepare on campus their proposal and submit it by email. Two rounds of review by experts: Team proposals will be reviewed by a panel of experts. After the first round of review, the 15 semi-finalists will be announced. During a second round of review, the three semi-finalists will then be chosen to participate in the final event at the Nespresso Headquarters in Switzerland. Final event (June 2020): The final event will take place in June, 2020 at Nespresso Headquarters, Switzerland. Flight transportation, food and hotel to attend the event will be paid for and arranged by the Challenge organizers. Registration to participate in the Challenge is open to top schools with MBA programs or other masters level degree programs (MM, MPA, MIB, MAS, etc). In the case that more than one team in a given school wishes to participate, we encourage an internal competition to select the best team from the registered school as only one team per school can participate. Schools are responsible for designing their own process for fairly selecting the student team on their campus. Should more than one team from the same school register for the Challenge, we will inform the teams and the university representatives, and formally request that they organize an internal competition to select the school representative team. There must be a faculty-level coach in charge of the team. All teams must consist of four students (no more or less). Gender-balanced conformation of the teams is highly recommended. Every team member must be formally and currently enrolled in the educational institution at the time of the case study release. Students on each team must be MBA students or from other master’s level degree programs (MM, MPA, MIB, MAS, etc.). Teams may include any combination of part-time and/or full-time students. Executive MBA students are not eligible. The final event lasts 2 days and will take place in Switzerland, Nespresso Headquarters, June, 2020. Flight, local transportation, food and hotel to attend the event will be paid for and arranged by the Challenge organizers. School registration should be done by a university representative (a “faculty sponsor”), and not by a student. Within 72H the faculty sponsor will receive the school code by email, necessary for the team registration and for any communication with the organizers. With the school code, team members will be able to register through the website. What is the profile of a good coach? What are the coach´s key tasks? The coach can help with the communication and presentation aspects. This could be by connecting with a Communications Coach to give advice on PowerPoint design, executive writing, stand-up presentations and effective Q&A. He/she can organize a practice presentation in front of experts in the case field. What are the key factors in the selection process to get the right team? Organize an internal competition right at the start of the academic year. Judge teams on their analytical capabilities, creativity, presentation skills and complementary team composition. Select students with experience in, or a demonstrated passion for, sustainability. How much time does a coach spend with the team? Between 2 to 4 meetings of roughly 60 minutes each during the two weeks of development of the written proposal. The case study, elaborated by INCAE Business School and CIMS in close collaboration with Nespresso, is an unpublished and untested one. It is based on the results of extensive researches carried out on Nespresso value chain. These researches are a product of a long-term research partnership with Nespresso, CIMS, INCAE and other organizations highly involved in the coffee sector and sustainability. The case study is released and sent by email to each registered team. On-campus, student teams analyze the case study and devise an innovative solution to the problem posed. All teams must certify, on the honor code of their school that the final submission is their original work. We expect students participating in the Challenge to demonstrate the greatest sense of fair-play and honesty. Student teams can submit only one final response, a “solution” for the case study. The proposal must be submitted in both Microsoft Word and PDF format. Please use the school code in the file name. Please do not write your University name or country anywhere on the proposal. The cover must include the Challenge title, proposal title, the school code, and date. The proposal should be submitted in 11-point Arial font, 1.5 spacing, letter or A4 format, 2.5 cm for both left and right margins, and 2 cm for top and bottom margins. It should not exceed more than 10 pages of text, including a one page executive summary. You may include up to 3 additional pages that includes references or annexes and appendices supporting data/analyses. References should be in standard academic format or ISO 690:2010. Please put your school code in the email subject line when submitting your proposal. Information not contained in the above points will not be considered, (for example, no external links). The school code must be used for all correspondence with the organizers of the Challenge. Once registered, teams are assigned a code to be used for all correspondence with the organizers of the Challenge. Students’ written proposal will be stripped of school names and made entirely anonymous to assure fairness and transparency of the process. Proposals will be randomly assigned a code consisting of numbers and letters to avoid any potential bias among the reviewers. The unique proposal sent by each team goes through a preliminary review and three rounds of evaluation. Upon receipt from the teams, all cases are stripped of any identification that could link the proposal to the school. All cases are then assigned a unique, randomly generated code that is the ONLY identifier of the case throughout the Challenge. The preliminary review is carried out by CIMS senior researchers based on a list of basic criteria designed to filter out cases that do not meet the minimum standards: Completeness of the case study, external sources of information appropriately cited, clarity of the proposal and general understanding of the case question. Each case proposed for exclusion is presented to a CIMS/INCAE team, including INCAE faculty, for discussion and validation. In the First Round, each case is reviewed and evaluated by no fewer than 4 individuals, including a member of the CIMS technical team, two selected evaluators, and at least one of the supervising professors from INCAE. The goal of this round is to identify the best 15 cases to advance to the second judging round. For this round, INCAE faculty members and researchers with specialization in sustainability-related issues, experts in the area needed for the case topic, provide the review. Proposals are selected to continue based on the evidence in the solution of: demonstrated understanding of the business situation presented in the case, creativity/quality of the proposed management response to the situation, general feasibility of the proposed response, and the quality of the quantitative and qualitative analysis supporting the proposed response. Prior to being excluded from, or included in, the next round each case is discussed in a meeting of the entire review team, with a member of the CIMS technical team presenting the case and advocating for its inclusion. After this review process is concluded, and the proposals are formally validated to continue, the unique codes are used to identify in batch (to only one administrative person on the CIMS Team) which school’s teams will continue to the next round. The 15 proposals that continue to the Semi-final round remain anonymous, with their unique identifier number, still with no way for any proposal to be identified or otherwise connected to a specific team. The 15 proposed case solutions, with their unique identifier only, are distributed to a judging panel consisting of academics, professionals, and business people all experts in fields related to the issues in the case. Each proposed solution is reviewed by at least two of these experts, and at least two supervising judges. Three finalists are chosen using the same general criteria and consensus based process described above. After this review process is concluded, and the proposals are formally validated to continue, the unique codes are used to identify the identities of the schools and teams that will proceed to the final round. Teams eliminated in the first and second rounds are informed by email. The top three student teams are notified directly and arrangements are made for them to attend the final round of the case competition. Andy Seidl, Ph.D, Professor, Department of Agricultural and Resource Economics at Colorado State University. Dr. Andy Seidl has been Professor in the Department of Agricultural and Resource Economics at Colorado State University since 1997. He is also Senior Technical Advisor to the Biodiversity Finance Initiative (BIOFIN, UNDP-GEF) and was Head of the Global Economics Program for the International Union for Conservation of Nature from 2008-2012. Dr. Seidl focuses on natural resource based economic development. He works in communities and countries with natural wealth to identify strategies for people to improve management decisions, capture economic benefits and encourage environmental stewardship. His recent work has included valuation of ecosystem services, economic vulnerability to climate change, and international environmental and development policy. His work appears in professional journals including Ecological Economics, Journal of Regional Science, Journal of Environmental Management, Journal of Environmental Policy and Management, Ecosystem Services, Economic Systems Research and in popular press including New Europe, the OECD Observer and World Conservation. He has served as judge for the Nespresso Challenge since its inception in 2013. Dominique Turpin served as IMD President from July 2010 until January 2017. He was also Nestlé Professor at IMD. He was previously the director of the IMD MBA (Master of Business Administration) and PED (Program for Executive Development). Professor Turpin has directed customized programs for companies such as Groupe SEB, Panasonic, Japan Tobacco International. He has extensive teaching, consulting and research experience in the areas of marketing and international strategy both in Europe and in Asia, particularly in the area of brand management, customer orientation and communications strategy. Dominique Turpin received his master’s degree from ESSCA in France. He earned a doctorate in economics from Sophia University in Tokyo, Japan. His current research focuses on brand management, and he has been widely published in more than 100 books, articles and case studies including the Financial Times, European Business Forum and MIT Sloan Management Review. Frank Wijen, Ph.D. Associate Professor of Strategic Management at the Rotterdam School of Management, Erasmus University. His research focuses on different facets of sustainable business, including stakeholder influences on corporate environmental practices, voluntary sustainability standards, and self-regulation around transnational commons. Dr Wijen published in top-tier academic and practitioner-oriented journals. He was marketing manager of a globally operating textile recycling company and is owner-manager of an international trade firm. Henri-Claude de BETTIGNIES is Emeritus Professor of Asian Business and the Aviva Chair in Leadership and Responsibility, Emeritus, at INSEAD. He is also the Distinguished Emeritus Professor of Globally Responsible Leadership at the China Europe International Business School (CEIBS) in Shanghai, and currently Visiting Professor at the Graduate School of Business, Stanford University. Founder of the Euro-Asia Centre, he initiated and lead the development of INSEAD in Asia. He had been teaching ethics at the Stanford Business School (1988-2005), before moving to China to create (2005) and lead the Euro-China Centre for Leadership and Responsibility (ECCLAR) in Shanghai. He has published 7 books and many articles and is on the Editorial Board of six academic journals and on the Board of several corporations and non-governmental organizations. Polly Courtice, MA, Director of the University of Cambridge Institute for Sustainability Leadership (CISL). Ms. Courtice is also Founder Director of The Prince of Wales’s Business and Sustainability Programme, and Academic Director of the University’s Master of Studies in Sustainability Leadership. Ms Courtice is a member of the University’s Environmental Sustainability Strategy Committee, the Board of Executive and Professional Education, the Northwest Cambridge Quality Panel, and on the Judge Business School Executive Education Ltd (JBSEEL) Board. She is a Director of Jupiter Green Investment Trust and a Non-Executive Director of Anglian Water Services Ltd, and is also on the environmental/sustainability advisory boards for AstraZeneca, Freshfields Bruckhaus Deringer LLP, Lloyds Banking Group and Nespresso. In 2008 Ms. Courtice was made a Lieutenant of the Victorian Order (LVO) announced in the Queen’s Birthday Honours list. In 2015, she was awarded the Stanford Bright Award for her contribution to environmental sustainability. Tensie Whelan, M.A, Professor for Business and Society at NYU Stern School of Business and Director of the Stern Center for Sustainable Business and Clinical. Ms. Whelan has 25 years of experience working on local, national and international environmental and sustainability issues. As President of the Rainforest Alliance, she built the organization from a $4.5 million to a $50 million budget, transforming the engagement of business with sustainability, recruiting 5,000 companies in more than 60 countries Mrs. Whelan has been recognized by Ethisphere as one of the 100 Most Influential People in Business Ethics, and was the Citi Fellow in Leadership and Ethics at NYU Stern in 2015. She has also served on numerous nonprofit boards and corporate advisory boards. Thomas Dyllick, PhD, Professor of Sustainability Management at University of St.Gallen. Dr. Dyllick is Managing Director of the Institute for Economy and the Environment and University Delegate for Responsibility and Sustainability. He served 2 years as Dean of the Management Department (2001-2003) and 8 years as Vice President of the University (2003-2011). He has co-founded the World Business School Council for Sustainable Business and co-directed the 50+20 Initiative, a vision of management education for the world. He also is on the Executive Committee of the Swiss “Sustainability at Universities Program”. Each team is given 15 minutes to present, followed by a maximum 30 minutes of questions and answers with the Judges’ panel. Time limits are strictly enforced. The presentation must be given in English. The order of presentations is determined by the Organizers. In the final Round, the judging panel consider the submitted proposal, the presentation and the discussion (Q&A). Teams need to bring two flash drives where both the PowerPoint file and the Executive Summary are copied. Computer and video projector are provided by the organizers. Please ensure that your presentation includes only relevant information and does not include information about your school. Dress code is business attire. All presentations are professionally recorded. A copy is distributed to all teams after all of their presentations have been made. No additional video or audio recording of presentations is permitted. Judges are selected by the Organizers and are from the Nespresso Corporation and academic community. One of the judges is designated Lead Judge to chair the question and answer session, lead the deliberations, cast the decisive vote in the event of a split panel and prepare an evaluation sheet for each team’s confidential use once the result has been determined. Judges have a maximum of one hour to render their decision. The panel’s decision is final. Scores allocated in the preliminary rounds will not count in the evaluation of the presentation in the final round. Lawrence Pratt, MPPM, Senior Lecturer at INCAE Business School, Costa Rica. Lawrence Pratt, graduate of the College of William and Mary (Virginia, USA), Master´s degree from the Yale School of Management (Connecticut, USA). Mr. Pratt is Senior Lecturer (with rank of Associate Professor) at INCAE Business School (www.incae.edu, Alajuela, Costa Rica and Montefresco, Nicaragua), where from 2010 to 2015 he was Director of the Latin American Center for Competitiveness and Sustainable Development (CLACDS). He is founder and director of the Ecobanking Project (www.ecobanking.com) and the Sustainable Markets Intelligence Center (www.cims-la.com). His research focuses on the incorporation of sustainability into national, sectorial and company competitive strategy. He serves as a consultant and advisor to numerous financial service companies in Latin America, Europe and the United States, as well as to manufacturing and natural resources firms. Mr Pratt is a past winner of the Aspen Institute Faculty Pioneer Award. Jean-Marc Duvoisin is also Chairman of Nestlé Pension Funds and Board Member of Nestlé Capital Advisers S.A. He has spent the last 27 years working with Nestlé. Prior to being appointed as Nespresso Chief Executive Officer in 2013, he was Deputy Executive Vice President of Nestlé Human Resources and Centre Administration. Much of his career with Nestlé was spent in Central and South America where he started in Colombia in the area of marketing and sales. He later became CEO of Ecuador, then of the region (including Colombia, Venezuela and Ecuador), and finally of Mexico. Mr. Duvoisin has a Master of Economics and of Political Science from Lausanne University. Alfonso Gonzalez Loeschen, Chief Customer Officer, Nestlé Nespresso S.A.
Alfonso Gonzalez joined Nestlé in 1992, starting his career at Nestlé Mexico where he held various positions in sales and marketing for Nescafé, Nesquik and Nestea. After several years in Mexico, he took over a Marketing Advisor role for Nescafé in the Coffee & Beverages Strategic Business Unit in Vevey. In 2000, he returned to Nestlé Mexico, where he became Division Executive Manager for Coffee & Beverages and Food Service. In 2007, Mr. Gonzalez took over new responsibilities moving to Nestlé USA as Vice President of Marketing for the Beverage Division. Early 2012 he became Country Business Manager of Nestlé Puerto Rico, where he managed all business in the market with full responsibility for the Food & Beverage portfolio in Puerto Rico and the Ice Cream business in the Caribbean and Central America. He took over his position at Nespresso in January 2015. Mr. Gonzalez has a degree in Marketing from the Instituto Tecnológico y de Estudios Superiores de Monterrey. Daniel Weston, General Counsel and Creating Shared Value (CSV) Director at Nestlé Nespresso S.A.
Daniel joined Nespresso as General Counsel in April 2011 from Nestlé Health Science, bringing to the team a strong mix of legal, intellectual property and commercial management experience. 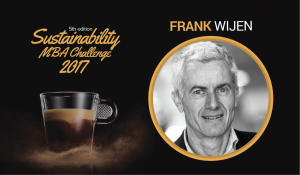 He subsequently took on additional responsibility for Nespresso sustainability approach as CSV Director in January 2015. Prior to joining Nestlé in 2007, Daniel worked for Novartis (in both its pharmaceuticals and consumer health businesses) and Johnson & Johnson. He also worked for 9 months for a medical and educational NGO in Rwanda after his legal studies. Daniel is a British citizen, a Solicitor of the High Court of England & Wales and a CEDR accredited mediator. He is a graduate of Leicester University and Guildford Law School in the UK, and received his business management training from Vlerick Management School in Belgium. Mr. Martinez joined Nestlé Nespresso in 2011 as Vice President, Human Resources for Nespresso USA. Under his leadership, his team and he have been instrumental in delivering strategic initiatives creating an employee centric organization. His prior experience includes working for LVMH, Safeway and Li & Fung’s Global Brands Group; a group of companies in luxury fashion retail, grocery retail, and manufacturing & distribution. Laz holds a Bachelor Degree in Organizational Behaviour & Leadership from the University of San Francisco. On May 1st 2017, Laz moved to his current role as Global Head of Human resources for Nespresso, based in Nespresso’s Headquarters. The three finalist teams will be invited to Nespresso MBA Challenge final event at Nespresso headquarters in Switzerland in June, 2020. They will have the opportunity to present and convince a panel of Judges of their proposal; this panel includes Nestlé-Nespresso top executives, high-level academics and sustainability experts. Flight transportation, food and hotel to attend the event will be paid for and arranged by the Challenge organizers. The winning team will be invited to visit Costa Rica, one of the Grand Crus supplying countries, during one week with all expenses included. There, students and their coach will have the opportunity to travel through beautiful landscapes, visit coffee plantations and coffee processing factories, meet farmers and other stakeholders who can talk about the impact of the Nespresso AAA Sustainable QualityTM Program. They will get a practical understanding of what Nespresso means by its “end to end approach to sustainability” while experiencing this small tropical country, leader in the green economic development and enjoying its beaches, forests and fauna. Flight, local transportation, food and hotel to attend the event and the trip to Costa Rica will be paid for and arranged by the Challenge organizers. 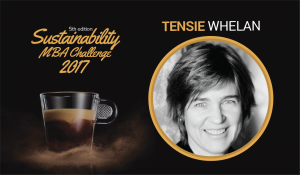 Any team member who is, or has been an employee of Nespresso S.A. or its parent company Nestle S.A., at any time during the past two years is ineligible to participate in the Challenge. Any team member who has worked as a consultant for Nespresso S.A. in supply chain management, coffee sourcing, or sustainability programs within the past two years is ineligible to participate in the Challenge. 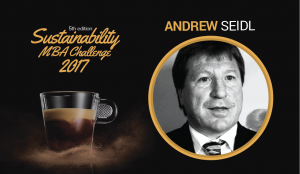 Any team member who has been engaged in research or advisory projects (independent or affiliated with any academic or consulting institution) with or for Nespresso S.A. in supply chain management, coffee sourcing or sustainability programs within the past year is ineligible to participate in the Challenge. Any MBA student who took part in a previous Nespresso’s Challenge is ineligible to participate to avoid any perception of an unfair advantage. All Business Schools are encouraged to participate each year in the Challenge but with new team members. Any violation of these eligibility requirements will lead to immediate disqualification of the team in which the non-eligible member is participating. Faculty or other advisors (instructors or coaches, formal or informal) supporting the teams must disclose to the organizers in writing any relationship (professional or personal) they have had with Nespresso S.A. or Nestle S.A. within the past three years. This disclosure should include a brief explanation of the nature of that relationship, the role the advisor played in supporting the team, and clarify how this role was consistent with the spirit of a fair competition. Failure to disclose a relationship will result in disqualification of the team. The organizers will review and consider the disclosure in a timely manner and render an opinion as to whether the relationship constitutes a conflict or perceived conflict that could negatively affect the competition. The organizers will then issue a decision regarding the eligibility of the team or the advisor. All information and data included in the teams´ submission (in original or analyzed form) must come from either the Case Study itself, the related Background Paper or from publicly available sources. All publicly available sources must be cited using accepted academic standards. Confidential (proprietary or non-public) or “inside information” from the company or its related business associates will not be considered in the analysis, and considered a very significant negative point in the judges’ evaluations. Judges and other reviewers will review all submissions “blindly” (no reference to the academic institution or the team members). The organizers will ensure that no judge will review any submission coming from his or her academic institution or any institution with which she or he has a professional affiliation.